I have to say a few things about the latest presidential elections in Malawi. Mrs. Joyce Banda lost the presidential elections in Malawi, coming out a distant third in the elections. 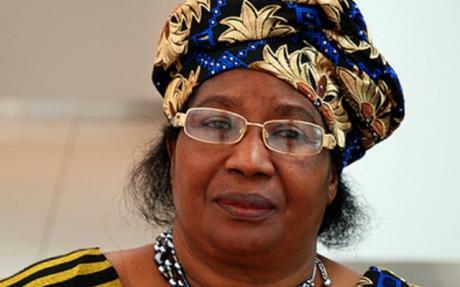 She had become interim president of Malawi after her predecessor Bingu wa Mutharika died in office in 2012. Peter Mutharika, a former foreign minister and brother of the predecessor, won with 36.4% of the vote, Lazarus Chakwera came 2nd with 27.8%, while Mrs Banda came third with 20.2%. Peter Mutharika was sworn into office on Saturday. Mrs. Banda had denounced serious irregularities, and wanted the whole election to be annulled; the high court rejected her request to block the release of results. Mrs. Banda then issued a statement congratulating Mr. Mutharika on his “victory in a closely contested election” and said she was “leaving office a happy person.” We are all happy that Mrs. Banda is conceading victory, even though we are not quite sure how 36.4% vs. 20.2% can be called a “closely contested election.” She leaving office “peacefully” is to be saluted. 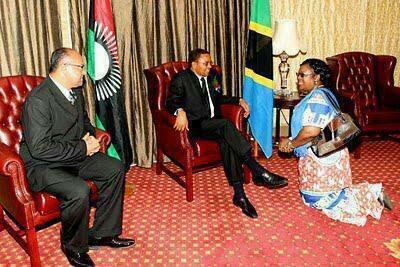 President Banda of Malawi kneeling to President Kikwete of Tanzania? However, Mrs Banda lost my respect the day I saw a picture of her kneeling in front of President Jakaya Kikwete of Tanzania: she claimed that she was a custodian of Malawian culture which made Malawian women kneel down when greeting men as sign of respect. That was the day, she went down in history for me: how can the president of a country kneel in front of other presidents? Are they not equal? Is she saying her country is kneeling to all the others? Did she forget that Malawi’s population also comprises men, who, following her logic, should not be made to kneel to greet other men? Mrs Banda was named 71st most powerful woman on earth by Forbes magazine in 2012, and 47th in 2013! Even Mr. Kikwete could not boast such a ranking. Just because Malawi is small does not mean that its head-of-state should bow to neighboring countries’ presidents. Did she see Angela Merkel of Germany or Cristina Fernandez of Argentina kneel down to anybody? If not, men should be kneeling down at Angela’s feet as she is the strongest leader in the euro-zone. I decided to give her the benefit of the doubt, and listen to those who said the picture had been ‘photoshopped’. That was until I saw other images of Mrs. Banda carrying buckets of water on her head, trying to “help” village women with their tasks of fetching water. 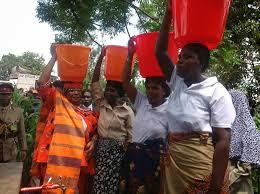 Why not provide free water so that these women will never have to carry buckets of water on their heads again? 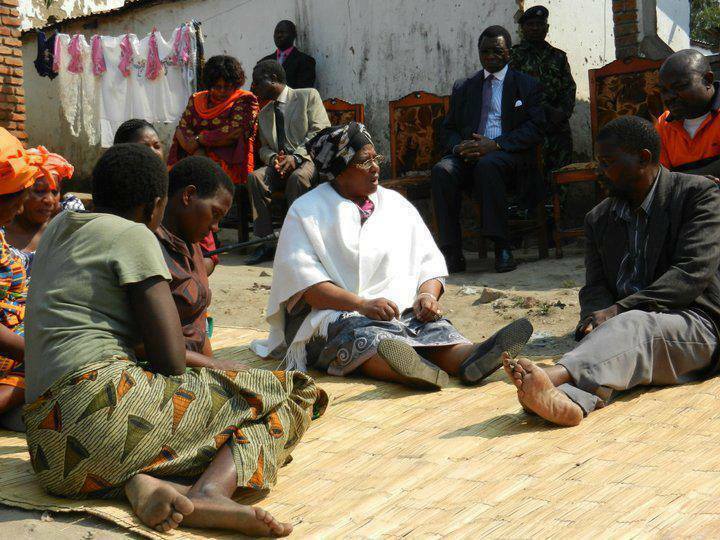 Another image was of Mrs Banda seating on a floor mat in the dust at a village gathering, while her security guards (all men) were seating in chairs around her in three-piece suits. What in the world was that? Was that the position of the African woman? Was that “humility”? Somehow, I never heard of Queen Nzingha, or Ranavalona I, or Queen Amina, or Amanishakheto kneeling down to anybody. In fact, Queen Nzingha had one of her servant form a human bench so that she could sit in a position of equality with the Portuguese governor of Luanda (who had refused her a chair). So who was Mrs. Banda mimicking then? As head-of-state, one should represent the nation, not seat in the dust and claim “humility”, or “closeness” to the people. The job requirement for president is not gender-specific: the job is not for a woman or a man, but for a leader. Once a leader, nobody cares how “humble” you are, but people care about you providing good healthcare, electricity, water, the minimum to lead a decent life, and negotiating at the table of nations in their best interest. Whoever is head-of-state, male or female, represents the sovereignty of the people of the country. I heard people saying “she is a quality African woman, well-trained by her culture.” Goodness gracious: she can stay a quality African woman in her house, but not as head-of-state, as she represents ALL the people of Malawi, not just women. In all fairness, higher pressures are put on women when they become presidents. They are singled out, and their mistakes overblown… but as presidents, they should represent their ENTIRE constituency, and serve ALL fairly… not fetch water on their heads, or kneel down to greet men, or sit in the dust. This was (and still is) her time to teach, educate, and elevate women in the Malawian society. The time is for thinkers, and leaders, not paraders!